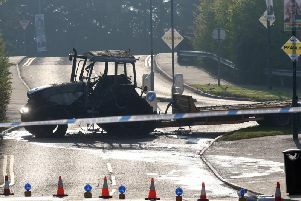 Lisburn and Castlereagh City Councillor Uel Mackin has spoken of the need for traffic control measures on the A49 in Ballynahinch after another fatal accident at the weekend. Thirty-six-year-old Paul Donnelly died following a two-vehicle crash on the Magheraknock Road at around 7.30pm on Saturday night. A 32-year-old man and a five-year-old girl were also injured in the crash. A Belfast Trust spokesman said they are both in a stable condition in hospital. Councillor Uel Mackin said: “A fatal accident at any time is a difficult situation for a family to face let alone during the run up to the Christmas period. Whilst I don’t know any of those involved it is still a very sad situation and my sympathy and prayers are, at this time, very much with the families of those involved. “As an elected representative for the area in which the accident occurred I am concerned that we have yet another incident which adds to a growing list of fatalities along the Magheraknock and Old Ballynahinch Roads on the A49. “This very busy road is an arterial route between Ballynahinch and the M1 and it’s long straight stretches enable traffic to move at high speed. “Whilst the road is in very good condition there are many hidden dips which are a big danger to road users. “I along with my colleague Edwin Poots MLA have, for some time now, been lobbying the Department of Regional Development through its agency Transport NI to have traffic management measures installed. “Last year some minimal work was carried out by way of additional signage and road markings but clearly it is insufficient.